Hanoi (VNA) – Prime Minister Nguyen Xuan Phuc hosted a reception in Hanoi on August 16 for Belgian Ambassador Jehanne Roccas, Ambassador and head of the European Union (EU) Delegation to Vietnam Bruno Angelet and Charge D’affaires of the German embassy in Vietnam Wolfgang Manig to discuss investment promotion activities of European businesses in Vietnam. The PM spoke highly of ties between Vietnam and the EU, and between Vietnam and Germany, Vietnam and Belgium in particular. The Vietnamese government always creates the most favourable conditions for domestic and foreign firms to do business in the country, he assured the guests. 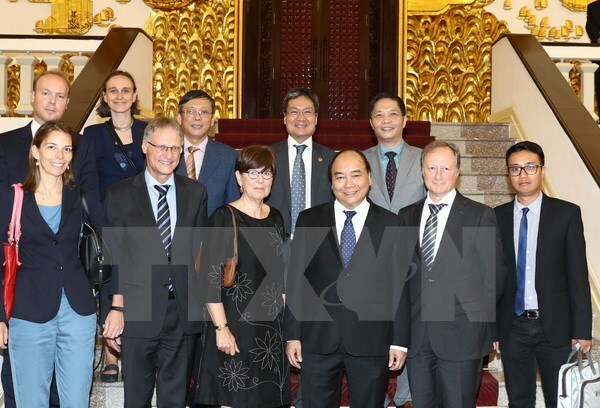 He affirmed that Vietnam always expects European investment on the back of their advanced and eco-friendly technologies, adding that he is ready to direct ministries, agencies and localities to clear barriers facing European enterprises in Vietnam. Discussing Hamon Corporation’s desulphurisation contract at Song Hau 1 thermal power plant, Belgian Ambassador Jehanne Roccas said Hamon wishes that the Vietnamese government and agencies would promptly push forward the deal on the mutually-beneficial basis. The host expressed his wish that the ambassador would serve as a bridge linking the two countries’ businesses together to learn about business environment and opportunities in Vietnam and Europe.